You are the captain of an unarmed mining vessel that has to navigate the space debris and alien satellites in order to collect the ore from the opposite planet and return to Earth safely. Launch your ship from the bottom of the screen, avoiding the sparks that drift across your path, and the shots from the aliens above. When you reach the aliens a shield appears around the nose of your craft that can be used to clear a path through the alien forces. There are four docking stations on the moon, and the points value of each station constantly changes. 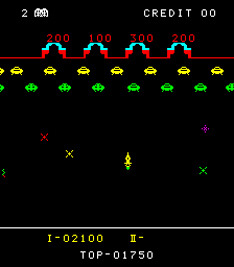 After collecting your points, pass back through the aliens and dodge even more shots and sparks until you land back on the planet.